Do I need to keep this product refrigerated? Or refrigerate after opening? No, this product does not require refrigeration. Can I recycle this bottle? Yes, this bottle is recyclable. Can I mix this product with dairy ingredients? Yes, this product can be used with ingredients like milk, cream, and half & half. It looks like a ring formed inside the neck of my syrup bottle. Is this normal and still safe to use? It is not uncommon to see this, but the manufacturer assures that this is not mold and it is not harmful. It can be caused over time from an oil separation in the syrup ingredients. It doesn't pose a food safety risk or alter the taste of the syrup. Containing quality ingredients, this Monin 750 mL sugar free Irish cream flavoring syrup is a quick and easy way to add new flavors to a variety of recipes! Add a splash of this zero-calorie Irish cream syrup to your most popular beverages and it's sure to please your guests. The rich, toffee taste and golden brown color of this flavoring syrup will enhance the nutty profile of your mixed or blended drinks without overpowering them or being too sweet. Plus, it's produced with sugar substitutes derived from plant sources, making it an all-natural syrup with a balanced blend of flavor and aroma that will instantly upgrade your coffees, mochas, smoothies, and shakes. Packaged in a glass bottle, this flavoring syrup is an excellent addition to any restaurant, bar, coffee shop, or cafe. It boasts a sleek appearance for an attractive shelf presence and can easily be paired with a compatible pump for quick, efficient service during peak serving hours. Since 1912, Monin has had a passion for delivering premium products that simplify the beverage-making process. Their sense of innovation and creativity has led to a wide variety of flavors and recipes to suit any menu. 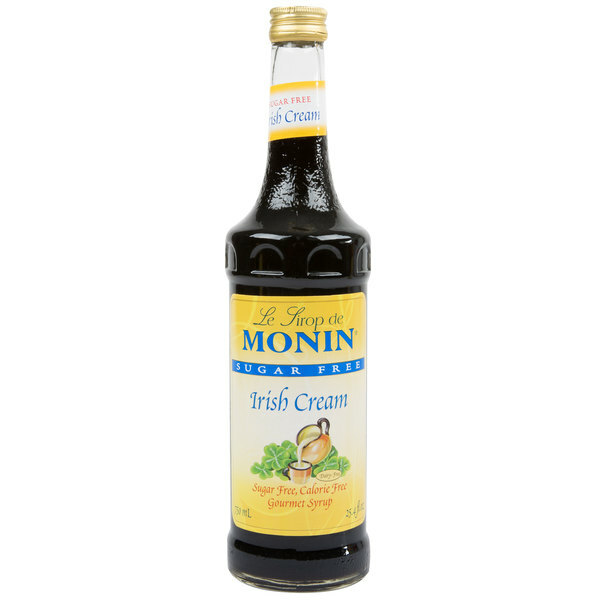 Use this Monin sugar free Irish cream syrup and craft superior beverages for your guests! This item has been Halal certified by the Islamic Food and Nutrition Council of America and it is permissible under Islamic law. This item is prepared without meat or milk products and is certified Kosher by the Kosher Supervision of America. Love all the Monin syrups, they look good on the counter and are very rich in flavor, we use these Irish cream all year, good stuff. Monins sugar free option for their Irish cream flavor is my personal preference. I don't know why some of the other syrups they use so much sugar. A delightful sugar free Irish Cream syrup that is marvelous and delicious. A great syrup for me since I am watching my sugar and its great to have great tasting coffee again. The sugar free Irish cream flavoring syrup is a great no sugar alternative for making a delicious latte or iced coffee. A great bold flavored syrup. I have always been a fan of anything that is Irish Cream flavored. This syrup is delicious and I have bought it many different kinds. It is the only brand that I trust. The most outstanding flavored sugar free coffee flavoring syrup on the market. The taste is great and the Irish Cream flavor is great in coffee. A great tasting sugar free syrup that is bold and decadent. It is great in our coffee. The Irish cream flavor is so yummy and we love the no sugar. Best non-alcoholic Syrup on the market. Its balanced flavor and taste beats even non-alcoholic Bailey's irish cream syrup. It is a hard one to find but thanks to Webstaurant.com, now I can easily buy it. We tried this syrup a few years back and immediately fell in love with it. It is a perfect substitute for "IRISH CREAM" from Monday through Fridays. The Monin sugar free Irish cream flavoring syrup is perfect for making no sugar specialty coffees. The syrup has a great flavor and is perfect for our no sugar customers. I think Monin really hits the Sugar Free syrups quite well. They don't have an off flavor or metallic flavor that other Sugar Free Syrups can have. My only issue and this is of course a personal preference is that I think its sweeter than it is flavorful in drinks. Depending on what you add it to, coffee for me, by the time you get a strong Irish Cream Flavor, its too sweet for me. But to each their own. Other than that it reminds me of Baileys but its not exactly baileys as there is no cream in it or a heavy mouthfeel. I use quite a bit of this one. Not because it isn't strong enough but because it tastes so very good. It is great in hot coffees, iced coffees, hot cocoas, milkshakes, etc.